There are generally two different obituaries when dealing with the death of a loved one. The newspaper obituary is a shorter obituary focusing on survivors and funeral service information. The funeral program obituary allows for a much more detailed story. 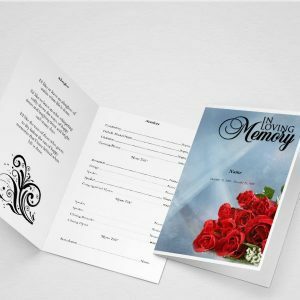 When attending a funeral, it has become very customary to provide a funeral program for the family and friends of a loved one. It serves as a very informative keepsake about a person’s life and also about the final services. 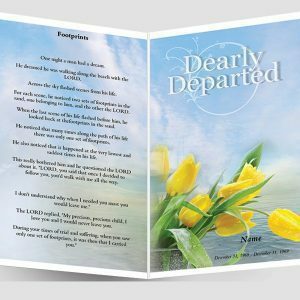 The main part of any funeral program is the obituary portion which is the story of their life, from birth to death for everyone to know about what the loved one has done during their time here on this earth. 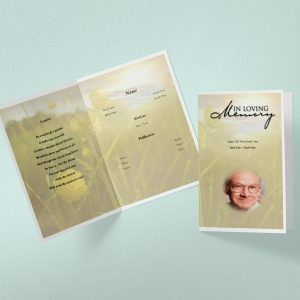 It is generally considered the most important part of the funeral program because it really gives a detailed writing about the life of the person. Being so important, it is also considered the hardest part to put together because information has to be pulled from different sources to really cover the entire life of a person, and not just one person’s viewpoint. Get contact information for people who knew your loved one. These contact people will be your resources for gathering information to cover the different time spans of your loved one’s life. Next, get information from those who knew the deceased during their after education period. Usually a very close friend or spouse would cover this part of the information. Finally, get the perspective of a younger generation that knew them. A child or favorite niece or nephew would be good to cover this information. Attempt to meet with all of your contacts at the same time or within a very close time frame so that stories as you hear may overlap and it can be put together correctly. One person’s story may help to fill in a gap from another’s story – that is why you would want to do the stories together or within a short time frame. 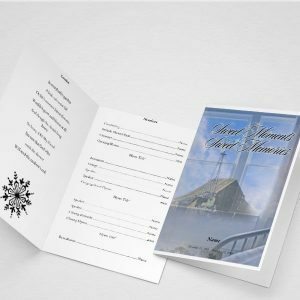 A memorial program is easy to create and is also known as a memorial program template, funeral memorial program, memorial service program, funeral program, obituary template, funeral brochure, etc. 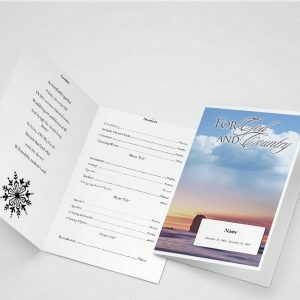 Memorial programs are easier to create if you have all the information gathered that you are going to include in your project. If you do not have all the information gathered yet, now worries, you can always start a memorial program to get some ideas then come back later and finish it. 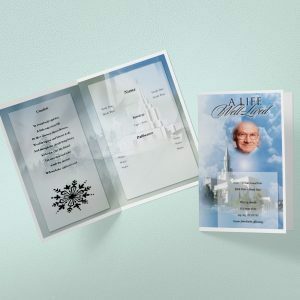 You can also create a memorial program of virtually any size. 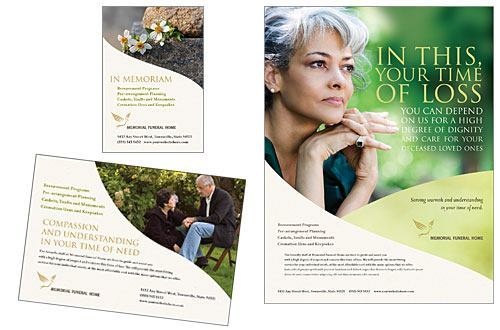 The example memorial program below is an example of an 17 x 11 memorial program. Other sizes of memorial programs are shown below. 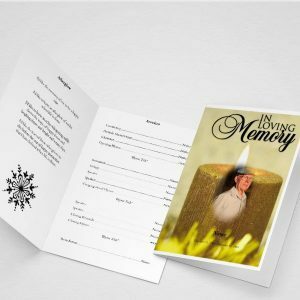 The neat thing about using Card Designer to create your memorial program is you can create such a custom finished product that it will look like you created it using Photoshop. 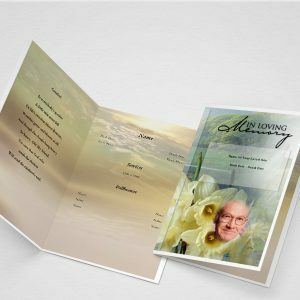 The only difference is we have made it far easier for you to create a memorial program and create it right online so you don’t have to download any software. All you need is your web browser. We recommend using Google Chrome. 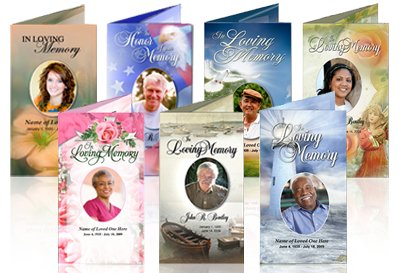 If you would like to create other products than a memorial program, you can do that as well. The pictures below show some of the other products that you can create with Card Designer’ online application. 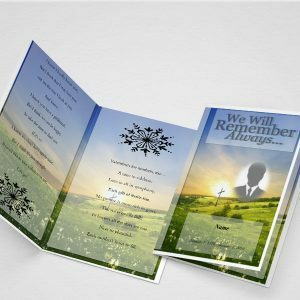 When you are done creating your memorial program, you will probably be surprised at what you have created. Many people say that they “can’t believe that they created what they did” and “how great the finished product looks”. 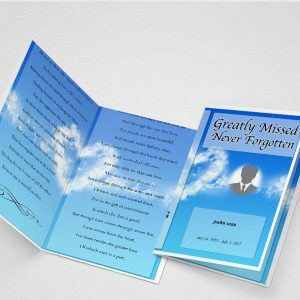 Our customers also often tell us that everyone at the memorial service loved the memorial program that they made and that it was the “perfect way to help celebrate the life of their loved one”. 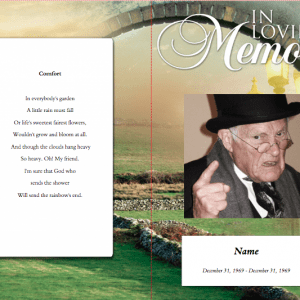 When you create your memorial program online, you can use any of our memorial program templates or upload your background. You can also upload as many photos as you want. Our eraser and masking tool will allow you to erase any portion of a photo and blend it into the background. You can add as many text boxes as you want and drag and drop them anywhere. 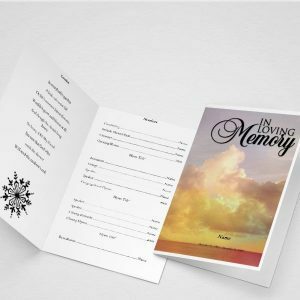 When you are done editing your memorial program, you will be able to save it as a PDF file and print on any printer. You can even transfer your PDF file to a USB/jump drive and take it to a near-by printing shop.